Delicious Three Bean Soup – in the jar and ready to eat. 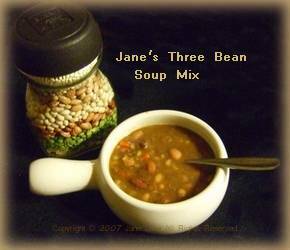 This is my original recipe for layered three bean soup. I like it so much that I’ve picked this soup jar mix as the one that I’m giving out in my Christmas gift baskets this year. I’ve designed the recipe to pack into a two-cup jar, which makes enough hearty soup to feed a large family. Serve the soup piping hot, garnished with shredded cheese and/or chives, and accompanied by rounds of fresh bread and butter for a satisfying and nutritious main meal. If you have enough left-overs, serve as a side dish or lunch the next day. Layer the ingredients in a two-cup jar, in the order given, lightly packing down each layer with a spoon before adding the next layer. If you have any room left in the jar, add a few more beans, peas, or vegetable flakes to fill the jar completely to the top. Empty jar contents into a large soup pot. Cover with 10 cups of water and bring to a boil. Simmer for two minutes; remove from heat, cover and let soak for one hour. After soaking time, stir in two more cups of water and bring soup back to a boil. Reduce heat, cover, and simmer, stirring occasionally, for 1-½ hours to 2 hours, or until beans are tender. If soup thickens too much during cooking, add more water as required. Season with salt and pepper to taste. Remove bay leaf before serving. After soaking time, add ½ to 1 pound of marinating beef steak or stewing beef, chopped fine; one chopped onion, one chopped carrot and one chopped celery stalk. If desired, add one 16oz can diced tomatoes. Continue cooking as directed for soup. After soaking time, add 2 cups chopped ham, one chopped onion, one chopped celery stalk, and one chopped carrot. Stir in a large pinch each of oregano, garlic powder, rosemary and white pepper, or your choice of Italian herbs. Continue cooking as directed for soup. Garnish with croutons and chopped green onions. Readers have emailed me asking about romano beans and where you can buy dried vegetables. I bought all the beans, and the mixed dried vegetable flakes at a bulk food store, so check similar stores local to you, or the bulk food section of your grocery store. I’ve found one source of dried vegetables at Amazon.com. These aren’t in flake form, so I think they are actually a higher quality of dried vegetables than the ones that I used. Given the choice, I would have used these. : Vine-ripened tomatoes, peas, carrots, corn, and bell peppers, dried to perfection. Nothing added; adds intense flavor to soups, sauces, and baked potatoes. You can also buy pinto and navy beans online but, at first, I couldn’t find an online source for dried romano beans – until I did some research and realized these are also known as cranberry beans, borlotti beans or roman beans. Essentially, they are a broad string bean, a little larger than pinto beans, with a nutty flavor, ranging in color from beige to brown, with some speckling. For convenience, I’ve included a link here for organic cranberry beans, organic pinto beans and French navy beans, all available from Amazon.